MealPlan is a weekly meal and grocery planning app that's focused on getting the job done efficiently. It's a fast, easy way to plan out your meals and groceries for the week. You use a simple drag and drop interface to plan out meals like “Hamburgers on Thursday, Fish and Rice on Friday”. Recent meals are easily available or you can type in new items the first time you use them. At-a-glance week view, with easy swiping between weeks. Simple drag and drop interface to plan out meals. Automatically generated grocery list based on your meal plan. Combined search/add box makes it easy to add new items. Print out a week's plan to any AirPrint printer. Configure your own meals: Add snacks, or remove breakfast if you don't want to plan it. Email a plain text summary of the week's plan. Tap on a meal to reorder or remove individual items. Magic Wand quickly plans out future weeks based on past choices (iPad only). Add a note to any meal item, including clickable links. Use the built-in web browser to find meals anywhere on the Internet, and drag-and-drop them right into your meal plan. Support for Apple Watch! 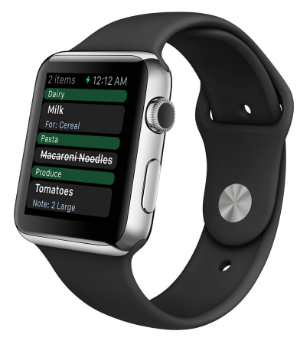 MealPlan brings your grocery list to your wrist. And once you’ve used the app for a few weeks, the Magic Wand will help you quickly fill out subsequent weeks, with a quick suggestions interface. Before MealPlan, I’d buy food at the grocery store and then forget I had it .. a few days later it would go to waste. A few minutes every week standing in front of the fridge with MealPlan in hand will help you get the most out of what you have on hand. And once you’re done planning for the week, print it out and stick it to your fridge. For information on using MealPlan, please visit the MealPlan Q&A page which includes a walkthrough of using MealPlan for meal and grocery planning. We think you'll love using MealPlan. Thanks for trying it. For information or support, please contact support@falldaysoftware.com.